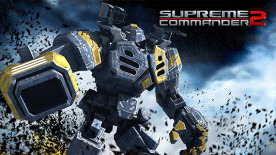 SUPREME COMMANDER 2 is the next installment in the award winning Supreme Commander franchise that boasts numerous game enhancements, in-depth campaign mode, multiplayer online and a unique storyline that represents a new dimension in RTS gaming. As one of three enigmatic commanders, you must strive to achieve global supremacy by forging vast armies over land, air and sea, complete with experimental war machines that could tip the balance of power at any moment. Prepare to experience brutal warfare on a breathtaking scale! Deploy wild experimental war machines that can change the balance of power at any given moment.